It's often worrisome for pet owners. How can I know that my pet is safe at home while I am at work, on the road, or out running errands? You want to be sure your pet can't get into trouble. That means avoiding household hazards, toxic plants, and other accident-waiting-to-happen scenarios. Dash over to Cape Rose Toy Poodles www.toypoodles.com where today we published a page devoted to Dog Safety. 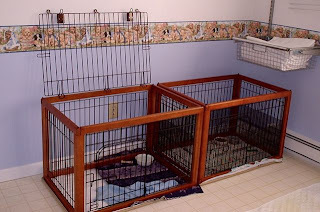 Our newest article provides information about dog condos like the ones pictured here as well as tips for setting up a "safe room" in your home. We also include links to the ASPCA's Pet Poison Control Center where you can order a FREE Pet Safety Pack with window decal and refrigerator magnet. Earlier this week we cautioned about the growing prevalence of tick-borne diseases such as Lyme Disease. And we pointed out how tricky it is for pet parents to know if their toy poodles are infected by these insidious illnesses. A blood test at the vet's office provides the quickest and most accurate confirmation if you have suspicions that things are just not right with your pet. Caught in time, tick diseases, including Lyme, anaplasmosis, and Ehrlichiois are usually eliminated by inexpensive antibiotic treatment. That said, you've heard the proverb: prevention is the best medicine. That's no less true for tick-borne illnesses. First, a few words on ticks and how they do their damage. The life cycle of a deer tick is a complicated, three-stage process. During one stage, the larval stage, the tick is no larger than the dot above this "i." This makes a tick particularly hard to see, especially on a toy poodle with dark hair or skin. During their life cycle, ticks are hosted by small rodents such as mice, voles, and chipmunks. The diseases carried by ticks do not seem to harm the rodents. But when those ticks later attach to and feed upon the blood of a larger mammal such as deer or dogs or humans, a serious, if not life-threatening infection can ensue. It is not unusual to suffer from a co-infection; that is, to be infected with two tick-borne diseases at one time. Not fun. Check yourself, your clothing, and your pet when you come in from outdoors. Eliminate, to the best of your ability, places where mice nest near your home. Have your yard sprayed professionally with permethrin, a pesticide that kills deer ticks but doesn't hurt mice. Treat the clothing you use for gardening or yard work with a permethrin soak like that used by the military. Apply tick-repellant sprays or creams to your skin. Use Damminix (R) Tick Tubes to reduce tick populations in your yard. Have your vet immunize your toy poodle against Lyme Disease. The immunization does not protect against other tick-borne diseases but protecting your pet from Lyme Disease is worth the expense. Use Frontline or another flea/tick control on your pet year round. Be especially vigilant that you don't become a fomite, a transporter of ticks into your home. We have learned by sad experience that, despite using every other precaution, we need to use Frontline Plus all year round, even here in Rhode Island where we are now in the deep of winter. As you read in our last blog, our toy poodle Chris is being treated for anaplasmosis. If you would like more information on tick-borne illnesses or the products we mentioned in this blog, please visit our Ticks and Tick Diseases page at Cape Rose Toy Poodles. As you discovered from our recent blog and the resources we recommended, tick-borne diseases are a growing threat to people and pets. Just think: It takes one miniscule deer tick a mere 24 hours or so of blood-sucking activity to infect you or your dog. Once in the bloodstream, the bacteria (in the case of Lyme Disease, Ehrlichiosis, and anaplasmosis) or the parasites (in babesiosis) multiply in a matter of days to the point where they can send a grown human being to the hospital in need of intravenous antibiotics. Worse is the fact that ticks, especially in their larval stage, can easily go undetected; you might never find the tick that made you or your dog sick. That's because a tick the size of a tiny dot, particularly on a toy poodle with black hair, can pretty much hitch a free ride--and get a free lunch. How Can I Tell If My Dog Is Sick? Unfortunately, knowing if your dog has a tick-borne disease is extremely difficult if you haven't found an attached deer tick. Tick-borne diseases are tricky for owners to diagnose. Your pet might seem feverish, listless, or lethargic. He might lose his appetite, a condition we call inappetence. (Now that's a clear sign of a sick dog, isn't it?) Your dog might seem to have stiff or painful joints. In short, the symptoms are pretty nonspecific and could apply to a number of different illnesses. Your best bet? Simply this: Know your dog's normal behavior and activity level and consult your veterinarian if you detect that something "just isn't right." After examining your pet and evaluating symptoms, the vet will probably do a "Snap" test. The SNAP 4Dx test from IDEXX Laboratories can determine, within minutes, if your dog has any of four diseases: heartworm, Lyme Disease, Ehrlichiosis, or anaplasmosis. 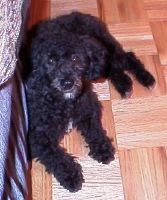 Our Chris, an elderly, black, toy poodle, was recently diagnosed with anaplasmosis quite by accident. We had taken him to the vet for a routine wellness checkup. The SNAP 4Dx test is performed each year at our vet's office and costs $45. Not cheap but it literally can be a life-saver. Good thing we had the test done. Chris's blood contained antibodies to the bacteria that caue anaplasmosis, indicating a current or recent infection. Our vet put Chris on doxycycline, an antibiotic that usually cures the infection in a few weeks. In our next blog, we'll offer several tips including one for a tick-disease preventative that we will now use 12 months of the year, instead of just during the warmer months. Apparently ticks in Rhode Island are active even in the dead of winter. When we were young, we lived on 22 acres in rural, northern Rhode Island. During the warm months our Scotch collie dog Flicka would sometimes return after forays in the woods with fat, swollen ticks around the scruff of her neck. While it was always a complete gross-out (even for country kids) to remove and kill those buggers, common dog ticks are not the ones we now fear as adults. No, it's the dog tick's tiny cousin, the deer tick (or black-legged tick), that scares us half to death now. This small creature--during part of its life cycle no larger than the punctuation mark at the end of this sentence--can literally bring human adults to their knees. We know several people suffering chronic after-effects of Lyme Disease. Hard to believe, maybe, but people and pets can and do die from tick-borne infections. If you live in an area hospitable to deer ticks, you and your pets are at risk of infection with any of several so called vector-borne diseases that sicken, cripple, and kill. Among the diseases carried by deer ticks: Lyme Disease, which is perhaps most widely known; anaplasmosis; Ehrlichiosis; and babesiosis. We have ourselves been infected with Lyme Disease twice. One of those times we got a nasty two-fer: we were coinfected with babesiosis. Our toy poodle Chris has had Ehrlichiosis and is at this moment undergoing antibiotic therapy for anaplasmosis. In upcoming blogs, we will tell you about a blood test for your pet that is perhaps the best money you'll spend this year. We'll also show you several ways to help prevent tick-borne illnesses from harming your pets or your family. And, no, shooting Bambi isn't one of our recommendations. Deer are actually victims of tick-borne diseases, too. Meantime, we implore you to visit just two sites. The University of Rhode Island Tick Encounter Research Center will show you how to distinguish between dog ticks and deer ticks. You'll learn a lot of other stuff, too. We promise you this: The Yankee Magazine article "Lyme Disease: One Woman's Journey into Tick Country" will shock and amaze you. It provides reliable information that the U.S. government actually created population(s) of ticks to serve as parasitic biological weapons. Reading Edie Clark's article will have you shaking your head in disbelief. But Yankee Magazine is a champion of reputable journalism. You decide. The Spot can be either outdoors in a special place in your yard. Or it can be in an indoor room that is easily cleaned and where you place a litter box or a disposable or reusable wee-wee pad. There is actually a third option which, admittedly, might not work with less intelligent breeds of toy dogs. A doggie door leading to a safe, confined spot outdoors can complement an indoor setup. The dog decides which "bathroom" to use at any given time. We have a dog door that leads to a second-floor, outdoor deck. The deck has no stairs and is, therefore, completely secure. No foreign dogs can get on our deck. And our toy poodles can't escape. Our pets are free to go out on the deck whenever they wish to relieve themselves, see the sights, or bark at the UPS man. Or multitask. Urine drains through the deck boards and poops are easy for us to pick up and place in the trash. In the summer, we have an awning over the deck. The awning serves two purposes. It shades the dogs--and us!--and it helps prevent predators such as hawks from swooping down. We live on the edge of the woods and we can sometimes see hawks high in the sky browsing for their next meal. They'd better stick with mice. When it's raining or otherwise inclement, our toy poodles sense that it's an "indoor bathroom" day. Instead of using the doggie door to go outside, they trot down to the laundry room and use the wee-wee pad on the floor. Whichever method you choose--outdoors, indoors, or combo--you will soon appreciate the fact that your toy poodle wants to keep your house clean to please you. Wouldn't it be nice to have a low-maintenance dog who "goes" on her own without dragging you from your easy chair? You can--if you train your toy poodle to use an indoor "bathroom" in a room that you select. We have. And it's wonderful! There are several ways to set up a toy poodle bathroom and still keep your house clean. It goes without saying that toy poodles are little. Most are smaller than average-size cats. Yes, some pet parents train their toy poodles to use litter boxes. Apparently, that method works well. Cleanup for small-dog owners is no more difficult than for people owned by cats. But instead of using a litter box, we've trained our toy poodles to use wee-wee pads that we place on the floor of our laundry room. The floor is solid vinyl so any "peripheral" errors are easily cleaned. 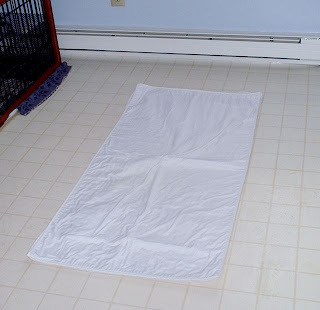 a "puppy pad") is a plastic sheet with absorbent layers on top. The plastic side lies against the floor. When your dog walks on the pad and relieves herself, the absorbent layers quickly take up any urine. Wee-wee pads are disposable. Just roll 'em up and toss in the trash. You might be thinking, "Why use wee-wee pads when newspapers are free?" And, besides, many newspapers deserve to be used in this way. A dog walking on newspapers, whether wet or dry, will always have dirty paws and smear newsprint all over the floor. Wee-wee pads keep your pet--and your house--cleaner. That said, wee-wee pads made for dogs are expensive. So what's the fix? You can use disposable chair- or bed-size pads made for people living with incontinence issues. These pads come in various sizes from small to extra-large. Choose a size that's appropriate for your dog and the length of time the pad will be on the floor. For example, if the pad will be down while you are at work, the extra-large size could handle several bathroom visits in your absence. 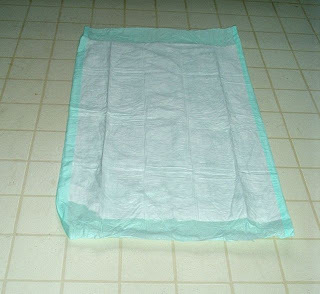 Human incontinence pads are constructed much the same as puppy pads. Use them the same way. Place on the floor in an easy to clean room. Dispose of the pad when it's soiled. Disposable pads are widely available. Most pharmacies and some grocery stores carry them. To save even more money, you can purchase reusable incontinence pads for people. Both chair- and bed-size pads are available, with several sizes in between. These pads cost more initially but you can launder them countless times. the pads in our washing machine and line-dry in the sun whenever possible. Reusable incontinence pads are sold in hospital supply stores. We also have several children's twin-size, bed-wetting pads like the one in the photo above. These, too, can be washed and reused. We recently purchased several at Target. They're not as sturdy or thick as the hospital-style pads but they work well and cost a lot less. A hospital-style pad might be $40 while a bed-wetting pad costs half as much. In our final installment, we will tell you about the combination house-training method preferred by our dogs. Toy Poodles is a resource for current and prospective toy poodle parents. Fetch tips about choosing a good breeder, raising your puppy, and caring for your toy poodle during his or her lifetime. Retrieve the latest news, views, and late-breaking developments in the world of dogs in general and toy poodles in particular. Toy Poodles has it all--from Adoption to Zoonoses. Thank you for sniffing around our den.